1.Can we define a class without main method? No, you can’t run java class without main method. Before Java 7, you can run java class by using static initializers. But, from Java 7 it is not possible. 2.Can main() method take an argument other than string array? No, argument of main() method must be string array. But, from the introduction of var args you can pass var args of string type as an argument to main() method. Again, var args are nothing but the arrays. 3.Can we change return type of main() method? No, the return type of main() method must be void only. Any other type is not acceptable. 4.Why main() method must be static? main() method must be static. If main() is allowed to be non-static, then while calling the main method JVM has to instantiate it’s class. While instantiating it has to call constructor of that class. There will be an ambiguity if constructor of that class takes an argument. 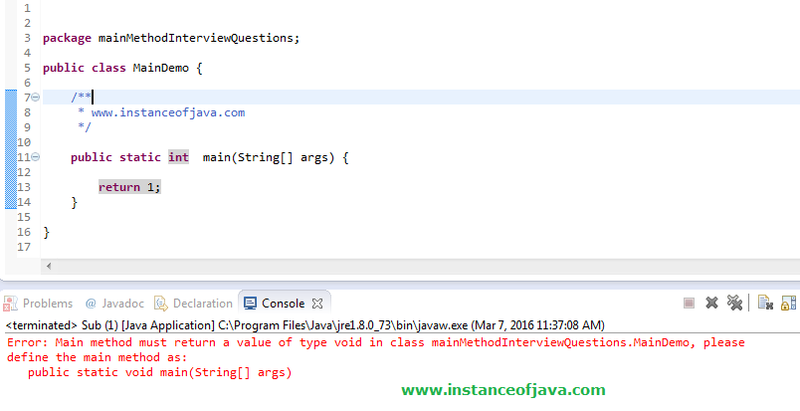 For example, In the below program what argument JVM has to pass while instantiating class “A”?. 5.Can We Declare main() Method As Non-Static? No, main() method must be declared as static so that JVM can call main() method without instantiating it’s class. If you remove ‘static’ from main() method signature, compilation will be successful but program fails at run time. 6.Can We Overload main() method? method with signature as “public static void main(String args)”. If you do any modification to this signature, compilation will be successful. But, you can’t run the java program. You will get run time error as main method not found. 7.Can we declare main() method as private or protected or with no access modifier? No, main() method must be public. You can’t define main() method as private or protected or with no access modifier. This is because to make the main() method accessible to JVM. If you define main() method other than public, compilation will be successful but you will get run time error as no main method found. 8.Can we override main in Java ? override static method in Java. 9.Can we make main final in Java? you can make main method final in Java. JVM has no issue with that. Unlike any final method you can not override main in Java. 10.Can we make main synchronized in Java? Why main method is not suppose to return anything if we do what happening with JVM? ?please explain in detail. The reason for the main method having void as return type is that once main finishes, it doesn't necessarily mean that the entire program finished. If main spawns new threads, then these threads can keep program running. The return type of main doesn't make much sense at this point.